Grilled Tri-Tip Steak with Chimichurri Sauce features juicy, flavorful meat accented by a tangy herb sauce. Perfect for cookouts! After some very fall-like, chilly days, we’ve had that characteristic return of hot weather—let’s call it “Last-Chance Summer“—that reminds us to get as much of the outdoors as possible while we still can. What better time for a cookout?! With that in mind, I’m sharing one of my all-time FAVORITE grilled steak recipes: Grilled Tri-Tip Steak with Chimichurri Sauce. 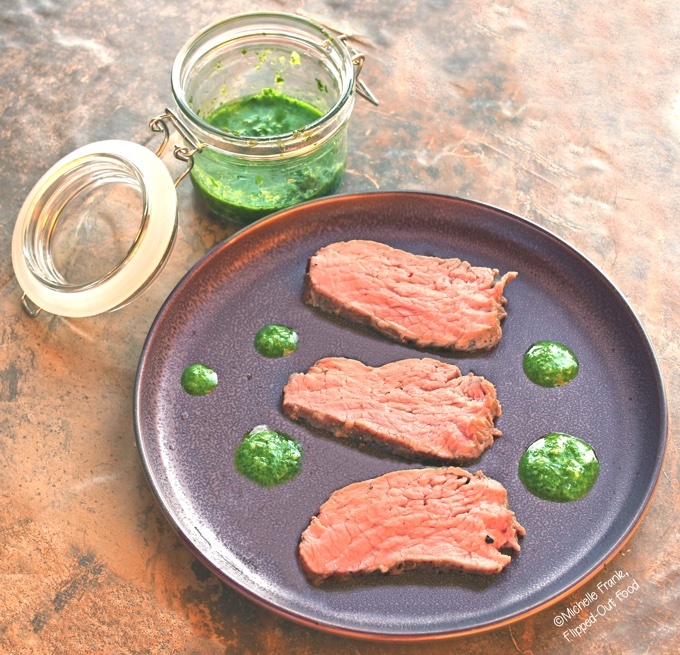 Grilled Tri-Tip Steak with Chimichurri Sauce: first, what is tri-tip?! The first time I ate (or even heard of) tri-tip steak was at a World Cup-watching party hosted by Brazilian friends back in 2006. They completely coated the tri-tip with rock salt and then grilled it until medium rare inside. After a rest, they scraped off the rock salt, sliced the meat into small steaks, and served with chimichurri sauce. Tri-tip steak is actually a roast. Tri-tip is one of those odd, underappreciated cuts of meat (much like flat-iron steak and hanger steak were a few years ago). It’s actually a long, flat, oddly-shaped roast. Although the trimmed roast is fairly lean, it has wonderful marbling throughout, which yields juicy, flavorful meat. Tri-tip roasts are also very budget-friendly: they approximate chuck roasts in cost. To this day, I don’t see tri-tip roasts often in my local grocery, but I am fortunate to have a provisions store close to my home that carries it on a regular basis (I just make sure to call in advance to be sure that they’re not sold out). Despite their continuing relative scarcity, all cows DO have tri-tips: it’s just a matter of cutting them. You can ask your butcher about the roast (be sure to do it well in advance!). If you get a “HUH? !” in response, tell the butcher that the tri-tip is the triangle/ boomerang shaped muscle located just under the bottom sirloin (on both sides of the cow). The beauty of tri-tip recipes is that you really don’t have to do very much to tri-tip to make it taste delicious. I used coarse salt rather than rock salt because that’s what I had on hand (but I plan to try the rock salt strategy soon! ); I also added freshly ground black pepper. 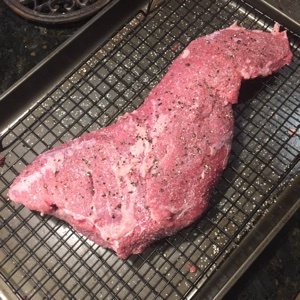 The key is to let the tri-tip roast sit at room temperature for at least half an hour and pat it really dry with paper toweling before you season it. Liberal amounts of salt are important: don’t be afraid! You’ll get a lovely crust on the outside, and tender, juicy meat inside. It won’t taste oversalted. Phil is the grillmeister in our house: he preheats a grill to 350º (medium), set up for indirect heat. Phil likes to use charcoal, but a gas grill will work just as well. He grills the roast directly over the coals (with the lid shut) until nice grill marks develop on each side, about 10 minutes per side. Then he puts the probe of a digital thermometer into the thickest part of the roast, moves the roast to the indirect heat side of the grill, and closes the lid until the temperature rises to about 125–130º for medium rare, which takes an additional 15 minutes or so (depending on the size of the roast). Once the roast is at the right temperature (we shoot for 128º), Phil pulls it roast off the grill, wraps it in foil, wraps that in a towel, and then puts the swaddled roast into an empty cooler for a half hour. Honestly, I think that the towel and cooler part might be overkill: if you don’t want the extra rigamarole, just try covering the roast with foil. After the roast has rested, we unwrap it and slice across the grain into ~1/4-inch steaks. One note about that: tri-tip roast is a very juicy cut, so it’s helpful to use one of those cutting boards with a groove around the edge, like the ones in this affiliate link. They’ll catch the juices and prevent a mess! You can also “cheat” and make grilled tri-tip steak with chimichurri sauce in a cast-iron skillet. The chimichurri sauce recipe below is the simplest variety of chimichurri. 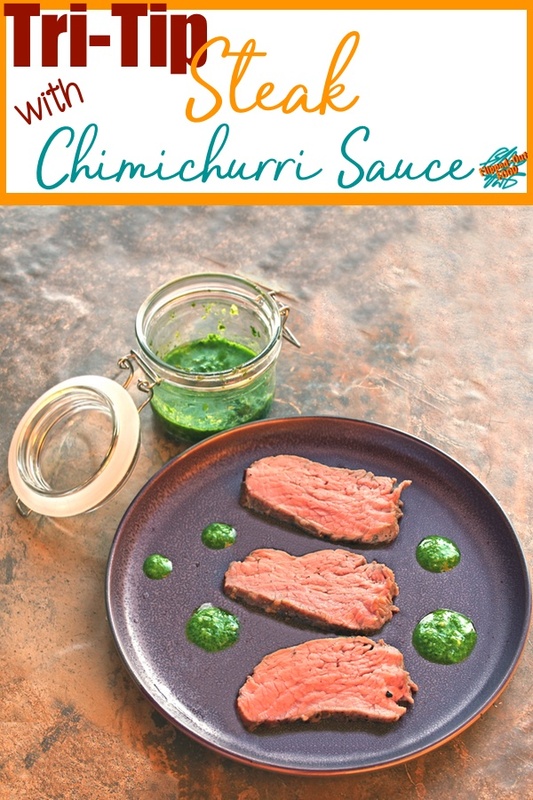 If you’re a chile head like me, you could also kick up the heat level by making my spicy chimichurri sauce. Of course, you could go the classic cookout side-dish route with traditional potato salad, loaded baked potato salad, or easy zippy coleslaw. In keeping with the South American theme, I love to serve an Argentinian Malbec alongside my grilled tri-tip steak with chimichurri sauce. That’s it! I hope you love this gaucho-inspired steak. (P.S. : leftovers make fabulous tacos!) Enjoy the last fleeting days of summer! 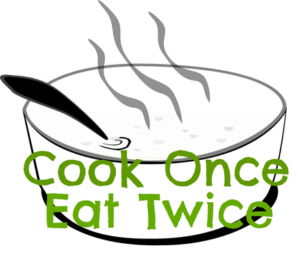 #CookBlogShare, a great food blogger recipe-share at A Strong Coffee. 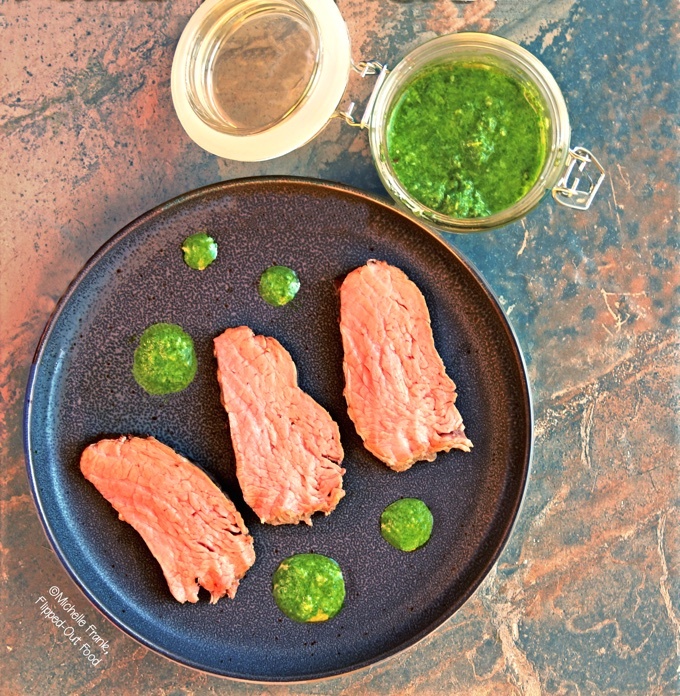 Grilled Tri-Tip Steak with Chimichurri Sauce is a perfect dish for cookouts, featuring juicy, flavorful meat accented by a tangy herb sauce. The steak can be grilled on a gas or charcoal grill, or seared and finished in a hot oven in a cast-iron skillet. Trim excess fat from the roast (you want some fat to flavor the meat). Remove any silverskin. Pat very dry with paper toweling. Mix the salt and black pepper and massage into all surfaces of the roast. Allow the roast to sit at room temperature for at least half an hour (and up to an hour). Prepare a grill for indirect cooking with medium heat (about 350º). Sear the roast directly over the coals or burners with the lid closed until dark grill marks develop on each side, about 8–10 minutes per side. Move the roast to the indirect cooking side of the grill. For best results, insert a digital probe into the thickest part of the roast and cook until the roast reaches ~128º for medium-rare, about 15–20 minutes more (or, start checking the temperature with an instant-read thermometer after 15 minutes; see Recipe Note #1). Remove the roast from the grill and wrap in foil (see Recipe Note #2). Allow roast to rest for at least half an hour. Slice against the grain into ~1/4-inch steaks. Serve with chimichurri sauce. Prepare the roast as directed for the grill method (above). Preheat oven to 400ºF. Place a large cast-iron skillet (or other heavy-bottomed, oven safe skillet) over medium-high heat. Add the canola oil. Sear the roast until well browned on both sides, about 2–3 minutes per side. For best results, insert a digital probe into the thickest part of the roast. Transfer the skillet to the oven. Cook the roast for an additional ~30 minutes, or until the temperature reaches 128º for medium-rare (see Recipe Note #1). If you don't have a digital thermometer, use an instant-read thermometer to check the temperature. Remove the roast from the oven and wrap in foil (see Recipe Note #2). Allow the roast to rest for half an hour. Slice against the grain into ~1/4-inch steaks. Serve with chimichurri sauce. Pulse the first 8 chimichurri ingredients (including crushed red pepper) in a food processor to make a coarse paste. Transfer to a storage container and pour the olive oil over the top. Let stand at room temperature at least half an hour before serving (see Recipe Note #3). Pulse the first 8 ingredients (including crushed red pepper) in a food processor to make a coarse paste. With the processor on, drizzle the olive oil through the opening in the lid until a smooth (pesto-like) sauce forms. Let stand at room temperature for at least half an hour before serving (see Recipe Note #4). Remove the roast at 138º for medium (I don't recommend cooking the roast beyond that). Grilling aficionados will tell you to place the foil-wrapped roast into an empty cooler (some even wrap the roast in foil and then a towel!). You can store the sauce in the fridge for 2 days: bring to room temperature before serving. I loved that you used that ‘odd, unusual’ cut of meat. It’s important to eat it all! And that chimichurri sauce looks incredible too. Thanks so much, Stine! I agree: I love eating the bits that most people don’t know about. They’re often surprisingly good! Really lovely recipe, I love ingredients that don’t need a lot of fuss to cook as well. Lovvveee CHIMICHURRI ! It packs such a nice punch and it’s so easy to make.. 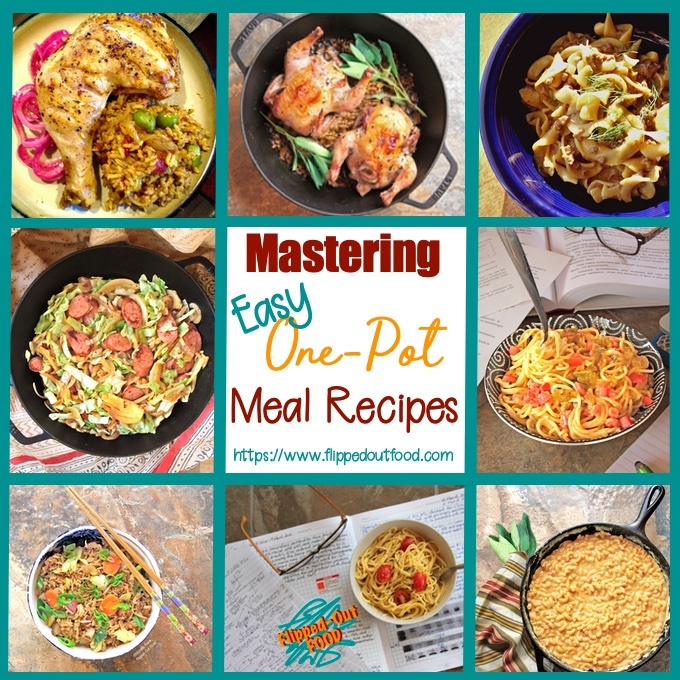 I love that there are a million versions so I will definitely be trying yours! This is something new to me. This looks so delicious and love that sauce. pinned! Thanks, Sri. I hope you love it! This really looks good! I don’t know this sauce but it looks quite good!